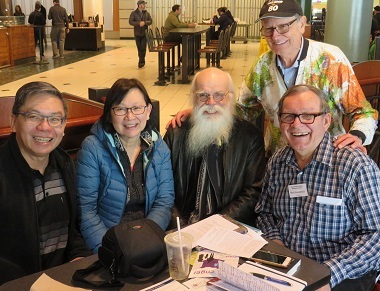 George Verwer’s recent visit brought together lots of old OM friends, including Peter and Doreen Quek, Rob Sinclair and Bert Kamphuis. 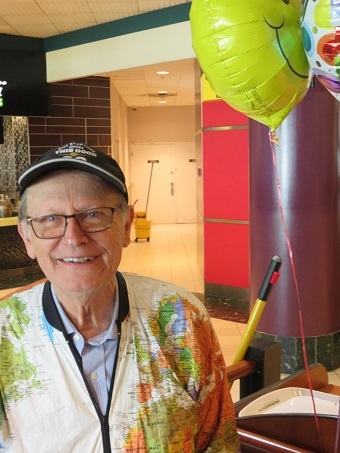 George Verwer is a man on a mission – and has been from the time he became a Christian at a Billy Graham Crusade when he was 14 until today, as he travels from city to city around the world – including Vancouver last Saturday (March 16) – celebrating his 80th birthday with old friends and fellow workers. At college, George and two friends met regularly to pray. They became burdened by the spiritual needs of Mexico. In 1957 the three friends sold some of their own possessions to raise money and gave up their summer vacation to distribute Gospels and other Christian literature in Mexico. The friends returned to Mexico the following summer, and the next. . . . The response in Mexico was so encouraging that they opened a Christian bookshop and launched evangelistic radio broadcasts there. OM is probably best known for smuggling Bibles into Eastern Europe and especially for its unique approach to distributing Christian, educational and children’s literature from OM Ships (currently Logos Hope). But they now undertake a very wide range of ministries in more than 100 countries. OM workers have founded more than 100 other ministries, large and small. Among the better known ones are Dalit Freedom Network (which has an office in Surrey), Gospel for Asia, Frontiers and People International. Just sitting there with Verwer in the Waterfront Centre Food Court near Canada Place provided plenty of evidence of the quality and variety of people who have worked with or been influenced by OM over the years. He met with people all day long, but just in the hour or two I was there many influential local and international leaders stopped by. Old friends and co-workers, others with similar interests – all helped to illustrate the difference a person with a vision can make. 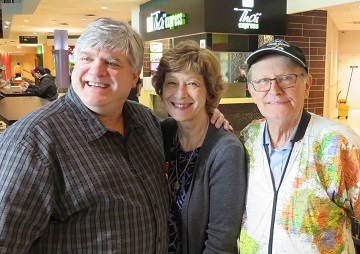 Randy and Margo Hoffmann with George Verwer. Bert Kamphuis hosted the event, along with Rob Sinclair. After working with OM as a young man, he led OM Canada for several years. He has been very involved with the strategic International Student Ministries Canada since 2001, first in Kamloops and now in Metro Vancouver. Randy and Margo Hoffmann serve with the Baptist General Conference of Canada as recruiters, trainers and educators, and head up the BGCC Muslim Ministry Team; they regularly reach out to Muslims around them. And I’m sure I remember Margo welcoming me to the very first Perspectives course in the Vancouver area many years ago. Peter and Doreen Quek met through OM; he was in Asia and she worked with Verwer on the International Coordination Team in Bromley, England. 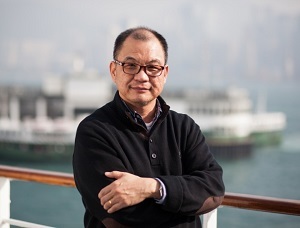 Peter has served as a teaching pastor for several congregations in Singapore, Toronto and Vancouver, and for a time worked at Regent College. He is now director of development for LeaderImpact Metro Vancouver. Paul Ndukwe and Ernesto Wong. Christina Aji, a young adult from Damascus, Syria worked for five years with New Heights ministry based in Lebanon. She wants to share how Canadian churches can engage more with God’s work in the Arab world and led a seminar at Missions Fest this year. 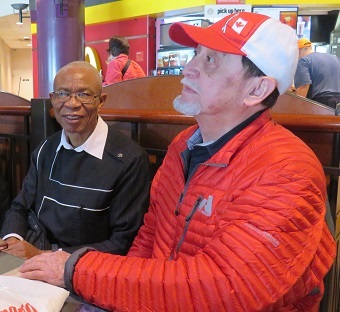 Others were Edith Granholm, now teaching at Trinity Western University; Bob Isaac-Renton, an architect who specializes in residential, care and church projects; Paul Ndukwe, CEO of Link International Ministries / ACES Canada; and Ernesto Wong, who first met Verwer in Mexico 40 years ago. All were involved on the ships or other OM. missions. Local OM reps George and Janet Barathan weren’t there, but that is only because they are overseas working with war widows in South Asia. George Verwer and two friends drove to Mexico in 1957. OM was noted for its rigorous approach. To the Least Reached, a book chronicling 60 years (1957 – 2017) of OM makes it clear that Verwer’s personality was a major influence. After receiving a sacrificial donation from a small Mexican church, George asked the pastor if he had a suit (he did not). Sitting in a darkened van, George said, “I have plenty of clothes” and took off his own suit, passed it to the pastor and drove off. He arrived at the team house around midnight, wearing only his underwear. This was typical. 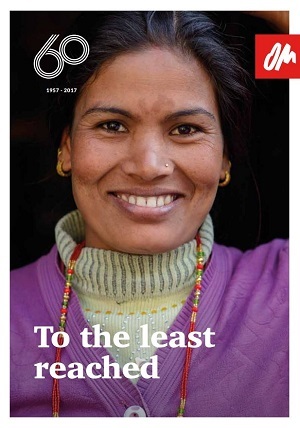 OM began on the cusp of the 60s, when young people worldwide were challenging the status quo. This was the perfect environment for an iconoclast like George Verwer and his nonconformist followers to bring a clear call to radical discipleship demonstrated in lifestyle and philosophy, not for a summer but for a lifetime. The Lord Jesus Christ was a Revolutionist! Consider . . . His most basic teachings: ‘Love your enemies. Whosoever will be chief among you, let him be your servant. Lay not up for yourselves treasures in earth. Except a man forsake all he hath he cannot be my disciple.’ . . . The Lord Jesus broke with any cultural pattern which interfered with the life of sacrificial love which he came to give! The individual who would live this life is of necessity a revolutionary individual, a cultural non-conformist, a ‘fanatic’ if you please! . . .
God uses fanatics – intensely focused individuals – in our midst to challenge our presumptions and cause the kinds of changes we need to grow and develop. . . . When I was a young Christian, I had a tendency towards extremism and super-spirituality. If I had not learned to accept the human factor in myself and others, I would have been knocked out of the race very early on. Referring to people with whom he has worked closely and still respects (and possibly to himself), Verwer said, “Godly people make stupid mistakes.” He also said he has learned that “God operates completely different from all of us,” and our expectations. George Verwer has spoken at Missions Fest several times since 1987 – and no doubt encouraged potential missionaries in this very Food Court. 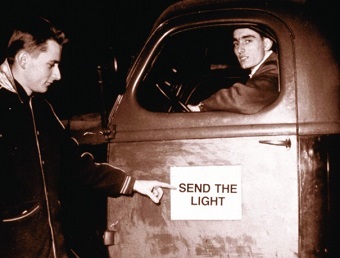 George has been a guest speaker at Missions Fest Vancouver from the early days. [Wearing the same world map jacket he had on at the Food Court.] His first visit was in 1987 and his most recent in 2008. If you’ve ever heard George speak, it becomes apparent very quickly that he is a man filled with passion for following Jesus, who desires to see others follow Jesus to the ends of the earth. Christians must take ownership of world missions. I have noticed a tendency for people to think that some other person or group is going to do it. I notice, in meetings right around the world, that it seems to be only a small number of people who are really taking ownership of the task. To be concerned with missions mobilisation involves a sense of personal responsibility. As we inform ourselves about missions, we need also to sense the weight of responsibility to take action. It’s possible to even be a missionary and yet not really take ownership of the bigger vision and task. These words still ring true, particularly as the Canadian church struggles to understand its role in global mission. . . . It was a pleasure and an inspiration to meet with George Verwer, and his partners in mission.